Ferienwohnungen Alpspitzecho in Garmisch-partenkirchen is an apartment building. 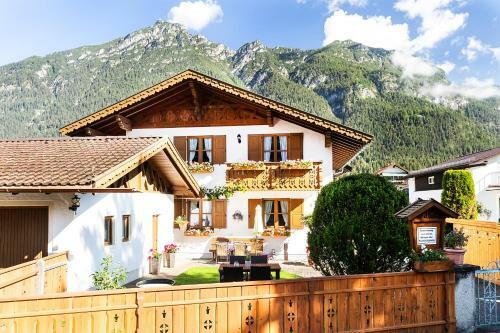 Situated in Garmisch-Partenkirchen, Ferienwohnungen Alpspitzecho features accommodation with seating area. Free WiFi is available. The units feature a living room, a kitchen, a private bathroom with a hair dryer, a flat-screen TV with satellite channels, a balcony and views of the mountain. An oven and coffee machine are also offered. The apartment offers a barbecue. Skiing is possible within the area and Ferienwohnungen Alpspitzecho offers ski storage space. Museum Aschenbrenner is 1.2 km from ...the accommodation, while Garmisch-Partenkirchen City Hall is 3 km from the property. Situated in Garmisch-Partenkirchen, Ferienwohnungen Alpspitzecho features accommodation with seating area. Free WiFi is available. The units feature a... living room, a kitchen, a private bathroom with a hair dryer, a flat-screen TV with satellite channels, a balcony and views of the mountain. An oven and coffee machine are also offered. The apartment offers a barbecue. Skiing is possible within the area and Ferienwohnungen Alpspitzecho offers ski storage space. Museum Aschenbrenner is 1.2 km from the accommodation, while Garmisch-Partenkirchen City Hall is 3 km from the property. When would you like to stay at Ferienwohnungen Alpspitzecho? Please inform Ferienwohnungen Alpspitzecho in advance of your expected arrival time. You can use the Special Requests box when booking, or contact the property directly with the contact details provided in your confirmation.